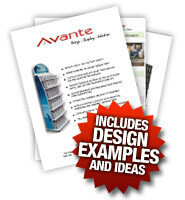 Avante POP Displays offers great benefits as well as savings when we partner with new businesses. This is because we retain a team of the most skilled and talented in the business. Known for their art and design skills and market understanding, our designers have helped generate over 300% increases in sales. Our permanent industry POP displays are available in counter-top and floor designs. Our concept-to-completion process saves you in time and energy. Flat packaging, easy shipping and assembly processes provide hassle-free ease. Our market presence has endured for two decades while establishing a reputation for being efficient and effective in our field. Employing award winning designers is what keeps us at the top. There is no such thing as a promotion project we can’t use to generate the strongest wow-factor. Stunning impact is needed for predictable, dependable sales results. We specialize in stopping shoppers in their tracks with eye catching solutions. Custom branding with a beautiful finish will distinguish your product and display from your competitors. Avante POP Displays has served this industry with fine craftsmanship point of purchase displays along with exceptional service from 1989. Because of this our customers are guaranteed the finest quality point of purchase displays that help make instant connections with customers. Simply call 250-497-5110 or 1-877-407-8655 in order to request a custom quote or download any of our brochures or catalogs today.